Note that you will have to interact with the setups, but the software does a really good job of cleaning everything off. This entry was posted in AutoCAD 13 (R13), AutoCAD 14 (R14), AutoCAD 2000, AutoCAD 2000i, AutoCAD 2002, AutoCAD 2004, AutoCAD 2005, AutoCAD 2006, AutoCAD 2007, AutoCAD 2008, AutoCAD 2009, AutoCAD 2010, AutoCAD 2011, AutoCAD 2012, AutoCAD 2013, AutoCAD 2014, AutoCAD 2015, AutoCAD 2016, AutoCAD 2017, AutoCAD 2018, Inventor 11, Inventor 2008 and tagged delete all Autodesk Products from your Computer, remove all Autodesk Products from your Computer, remove autodesk, uninstall all autocad, uninstall all autodesk, uninstall autocad, uninstall autodesk, Uninstalling all Autodesk Products from your Computer. Bookmark the permalink. 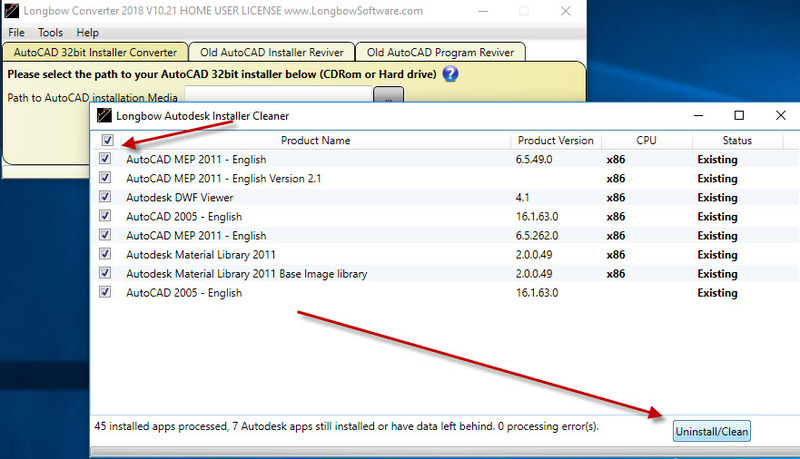 Downloaded longbow converter in hopes of uninstalling AutoCad 2017 from my laptop. When I start the converter, go to tools> advanced, click on Uninstall all Autodesk products, I get the error message AcadMsi converter has stopped working. Please help.